Top of the line BSM 160 mm (6") speaker system. BSM160 1pr, HF30B 1pr, BSM160 Crossovers and ER160 grills. The BSM Series is the flagship of the AVI mid devices. The goal of the BSM was to bring home audio sound quality to car audio. So these midbass devices were designed for superb sound quality. The most extraordinary characteristic of the BSMs are their ability to produce extremely warm sound. To achieve this goal, both models needed high-end parts such as: a 50 mm (2") aluminum ribbon voice coil, a 668 g (23.5 oz) magnet, and a white ceramic paper cone with composite rubber edge, just to name a few. The BSM-160 is for the ultimate performance sound system, and the operating range suggested is 70 Hz to 4.5 KHz. This tweeter is the king of all Tweeters! It is currently the largest car audio tweeter available. The neodymium magnet is 3 times the size as the one used in the HF-25T. It produces the highest output of power among all of the tweeters. The mounting hole is 50 mm, so the increased performance you get is only by a 5 mm difference. 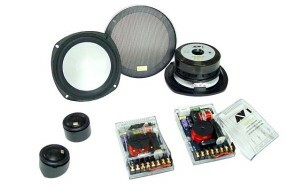 This tweeter is for very high performance 2, 3 or 4 way sound systems. The suggested operating range is 2.5 to 20 KHz., and the minimum crossover frequency is 2.3 KHz.